HCM City (VNS/VNA) – HCM City’s Tan Son Nhat International Airport is expected to receive more than 4 million passengers in the month during Tet, the Lunar New Year, which falls on February 5 this year. 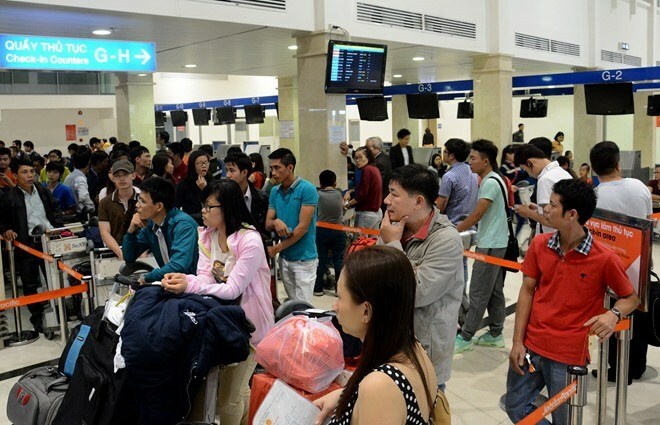 The Tan Son Nhat Customs Bureau has launched a programme to welcome passengers, especially overseas Vietnamese coming home at the start of the Year of the Pig. It has introduced an app which can help passengers find information about customs procedures for their luggage and the estimated duty on goods they bring in. According to the bureau, the airport will serve an average of 134,200 passengers a day during the month. Nguyen Nam Tien, Deputy Chief of the Tan Son Nhat Airport Authority, said the airport would provide services to passengers on 890 flights on the 28th of the last lunar month (February 2) and 900 flights on the 6th of the first lunar month (February 10). The number of flights to and from the airport is expected to increase by around 10 per cent from last year to 806-820. Vietnam Airlines will fly an additional 1,956 flights and carry around 650,000 domestic passengers, up 40 percent from normal days. Vietjet will add more than 1,000 flights, up 20 percent, while Jetstar Pacific will provide 1,014 more flights, up 15 percent. The busiest routes will be to Hanoi, Hai Phong, Vinh, Hue, Da Nang, and Phu Quoc. The Airports Corporation of Vietnam has called on airport authorities across the country to step up efforts to ensure security, safety and service quality during the month. Tien said his agency has taken measures such as increasing staff for ground services to ensure quality and aviation security and safety.